Is France going to get rid of the Hôtel de la Marine ? (and Riesener) ordered for this place. Try to imagine one of the most beautiful historical monuments, on one of the most majestic squares in the world, in the capital of a major industrialized country at the outset of the 21st century. Again, imagine that this building houses rooms decorated in wood paneling and with a wealth of its original furniture commissioned from the finest cabinetmakers of the 18th and 19th centuries. Imagine that these stately salons have just been restored at great cost thanks to funding from patronage. Finally, try to imagine that the country which owns this monument is getting ready to hand it over to a private firm without any guarantee as to the future of this furniture. 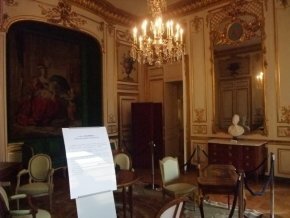 This is no dream (or rather, nightmare) but what is in fact in danger of happening today to the Hôtel de la Marine built by Gabriel on the Place de la Concorde in Paris, although it has recently undergone an excellent restoration (see our article). For the last few months now, very alarming rumors have been flying concerning this illustrious building. Some of them are true, others have not been verified exactly as the case is being handled for the moment at the highest levels and few people, even at the Ministry of Defense, have been informed in any way. Lip service and disinformation are the order of the day. The Navy’s general staff will move, at the earliest in 2014, to what is called the “French Pentagon” which is to group together all of the departments of the Ministry of Defense in the Balard neighborhood in Paris. This regroupment and the construction of the new ministry buildings are to be “self financed”. Another purpose, a profitable one if possible, will have to be found for the Hôtel de la Marine once the occupants have left. The sale of the building has been planned for a long time, but this possibility has set off strong opposition ; the decision seems to be headed towards a long-term rental, for a duration perhaps, let us remember, of 99 years ! France Domaine, the government department in charge of this type of sale, has been handed the case. We tried to find out a bit more from its head, Daniel Dubost. When we asked what type of rental was planned and the conditions, the answer was sibylline and in no way related to our question : “this building is not for sale. We cannot help you any further.” Sic. 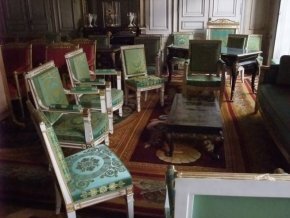 The information and public relations office of the Navy, did finally inform us on 18 February by telephone, that, to its knowledge, no decision had been made as yet but that “all options are still open.” The rental or sale and removal of the furniture from the Hôtel have not been excluded. Officially, the Ministry of Culture “does not have any information to communicate on the case”, leaving us fearing the worst. Furthermore, we have received two types of information, which are unofficial and contradictory. From the Defense department : the sale has been decided and would take place shortly ; from the Ministry of Culture : the building might house a major government institution and the furniture would remain in place, with open access for the public. As we can see, the situation reflects both a dramatic lack of consideration for an important heritage landmark as well as a distressing ineptitude and secretive procedure all too customary in the French government administration. A long-term rental is as unacceptable as the sale to a private firm. The Hôtel de la Marine is a veritable “anthology of the furniture in decorative arts from the 18th to the 20th century. ”. 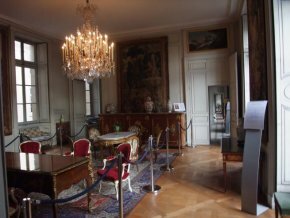 It should remain under control of the French government, its furniture should remain on location and the public should have open admission. At a time when the President of the French Republic, Nicolas Sarkozy, insists on the importance of the country’s history, it would be difficult indeed to understand then why he would persist in wishing to sell one of its most emblematic elements. According to Jean Ducros, Secrétaire général de l’association des Amis de l’Hôtel de la Marine.